Bake with water bath on the bottommost rack in a preheated 200�C / 392�F for 18 mins, then lower to 140�C / 284�F for another 30 mins (let the heat in the oven to drop gradually with door closed) and turn off the oven and leave cake in the closed oven for another 30 mins. Remove water bath and open the door of the oven slightly at the end of the baking for another 30 mins for cake to cool. Egg � Size: large. I separate the yolk and white by using cold egg. By the time you�ve finished preparing the cream cheese batter, the egg whites are just nice to beat into meringue. Cream Cheese � I used Philadelphia through out all my Japanese cheesecakes, hence, I am not sure how other brands of cream cheese work for this recipe. Cake pan � I recommend that you use a 3″ tall non-black round cake pan of 8″ (may be this cake pan is a good fit, found in Amazon). If you cannot find a 3″ high cake pan, then replace it with a 9″ round cake pan with at least 2.5″ tall. Use a 1-piece punch out cake pan, not springform pan or any other seamed pan. Grease & Pan Lining � grease the side of the pan with butter and line only the bottom of the pan. Do not line the side of the pan, it will cause a crumple side. This is because when the cake shrink, it will drag the paper down and cause the crease. Batter � the cream cheese batter after adding flours and before folding into meringue should be a little warm, about 40-50 �C. Meringue folding *** VERY IMPORTANT *** � folding egg white meringue to cream cheese batter needs to be gentle to minimize the deflation of tiny pockets of air in the meringue. Make sure both batter and egg whites are well incorporated and come together. Batter filling � only fill Japanese cheesecake batter about 15mm (1/2″) from rim, if you have extra batter (it shouldn�t be a lot left), discard it. Unmold cake � The cake pan should be able to handle by bare hand after cooling off in the oven with door slightly open for 30 mins. Use a cake board to cover the cake pan, invert the pan and carefully remove the pan. Remove the bottom liner and place another cake board or plate on the bottom of the cake, invert it back. The cake should be soft and fluffy and jiggly when it is still warm. Leave it to cool before sending it into the fridge. The final cake size after shrinkage is about 7.5″ x 3″ (highest point) Cake serving � Decorate the top with snow powder or icing sugar. Cut the cake with warm knife, wipe the knife clean before the next cut. 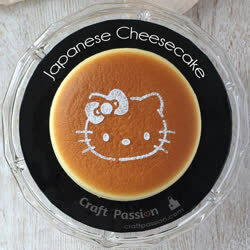 Buy Hello Kitty Cake Stencil, here.